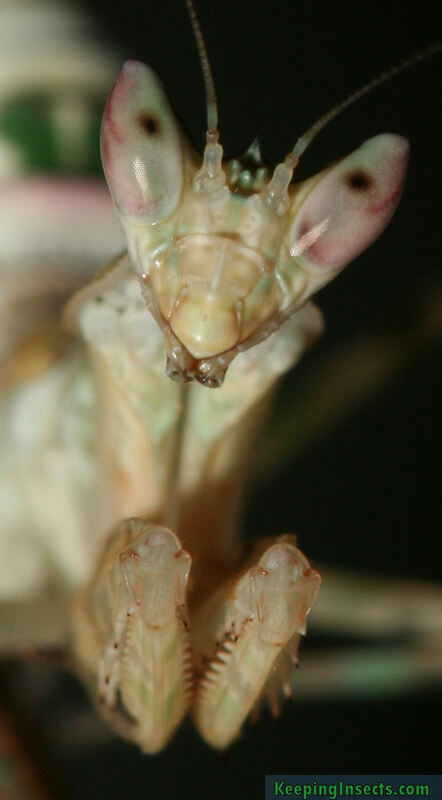 The Indian Flower Mantis, or Creobroter pictipennis, is a mantis species in the flower mantis group. 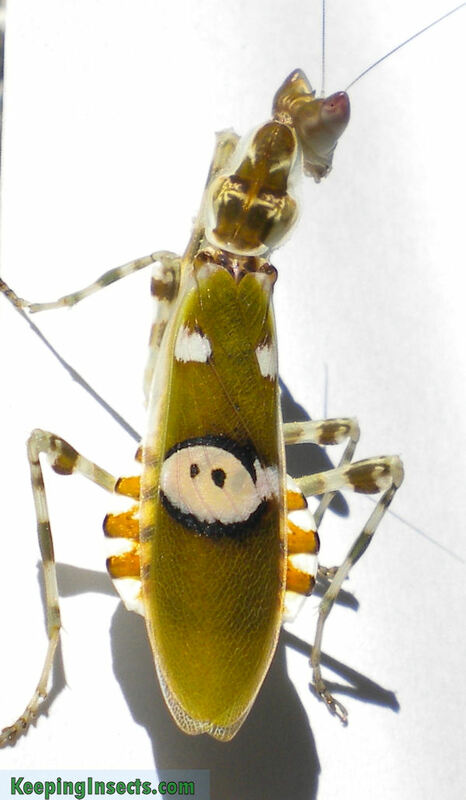 Creobroter gemmatus is very similar to Creobroter pictipennis, only the pattern on the wings is different. The care for both species is the same, therefore you can use this caresheet also for C. gemmatus. Creobroter pictipennis is a creamy white color on most parts of the body. The top of the abdomen has some with green-brown blotches and the legs are striped green and brown. When adult the body is white with green accents, the wings are green with a striking yellow-white eye patch that is designed to scare away predators. The adult females are about 4 cm long while the male is about 3 cm long (approximately one inch). The adult males are long and slender and have wings that are longer than their abdomen. The adult females are bulkier and broader, with wings that extend just a little bit over the end of the abdomen. 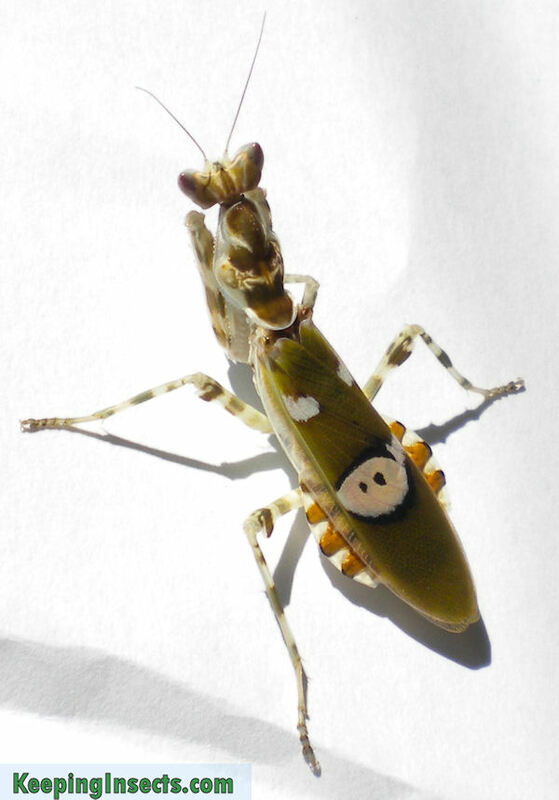 The Indian Flower Mantis Creobroter pictipennis is a moderately active kind of praying mantis. They actively hunt prey once it is aware of it, but if there is no prey around it can stay in the same spot for days. The adults very often run away if they feel threatened, adult males will fly away often. They are very quick. This species also shows a deimatic display to scare off predators, they will hold their very spectacularly colored wings in upright position and spread their forelegs out wide. 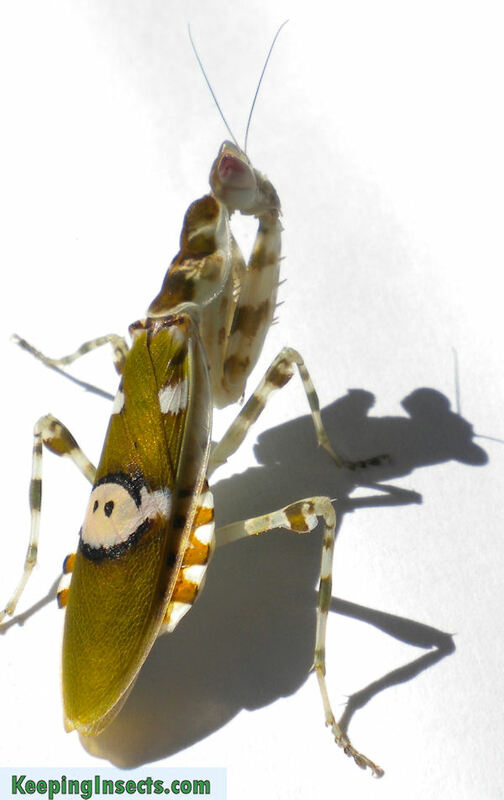 The patch on the wings and the bright colors suddenly become visible when the mantis shows this deimatic display. 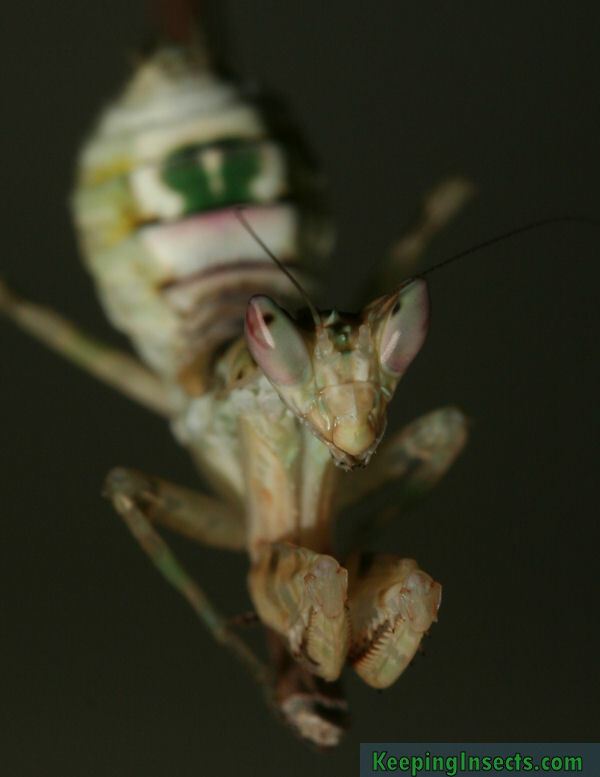 A bird who wanted to eat the mantis can be scared off by the colors, allowing the mantis to escape. 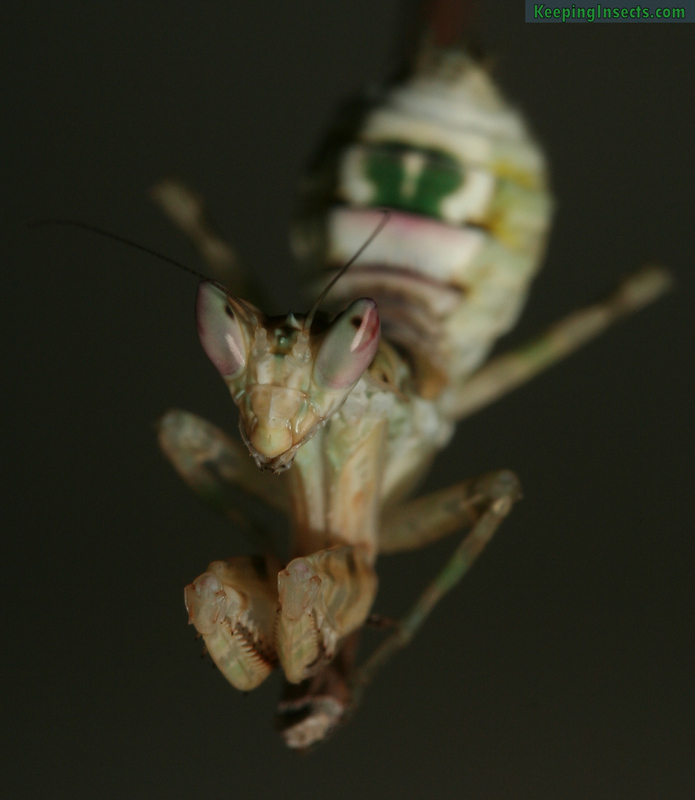 Because of the small size of this mantis, you can feed it all its life on fruit flies (Drosophila hydei). This species can attack very large prey without a problem, so you can also start to feed green bottle flies and for the adults blue bottle flies. Crickets can also be fed, but it is better to feed this species only flies. If you want to learn how to breed your own fruit flies instead of buying them in the pet shop, you can check out our Fruit Fly Breeding page. The ideal temperature is about 25 ° C, but a temperature between 23 and 30 ° C is good. At night you can allow the temperature to drop to 17 ° C.
This species has preferred to stay moist, a RH of approximately 60 to 80%. This can be achieved by spraying four times a week, but this depends on the ventilation of the enclosure you use. 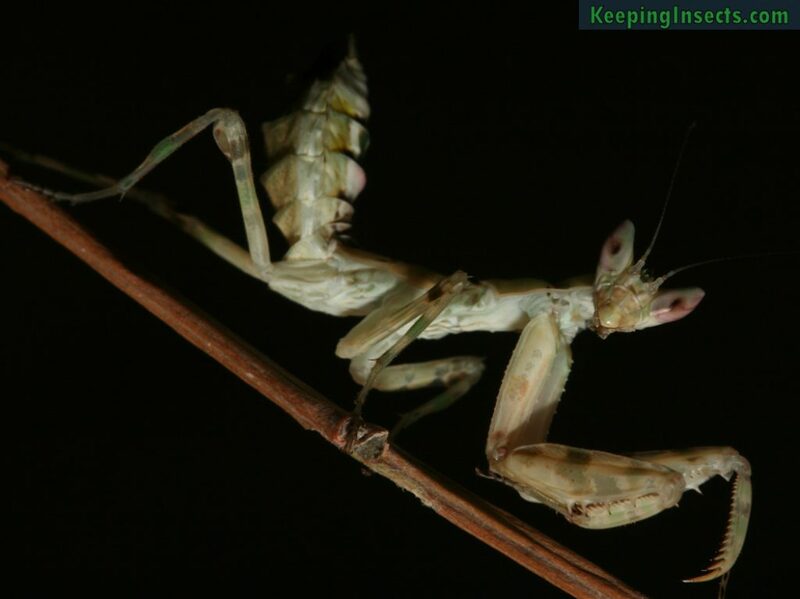 As with all species of praying mantis, the enclosure should be at least 3 times the length of the animal in height, and at least 2x the length of the animal in width. For an adult this means about 12 cm in height and 8 cm in width. A nice size for a terrarium would be 15 x 10 x 10 cm (h x w x d) or bigger, so there is room for lots of fake plants and perches. Group housing for Creobroter spp. Because Creobroter pictipennis is, like all praying mantids, a predator it is advised not to house them together in one enclosure. Sooner or later one will eat the other until finally only one mantis is left. Nymphs can be kept together until about L5 (fifth instar) when fed constantly and given a lot of space. The difference between males and females is clear once they are adult. The males are much more slender than the females. When the nymphs are older, you can already see this difference. When the nymphs are older you can also see that the males have much thicker antennae than the females. For younger nymphs you can use the segment-counting method, described here. Approximately 2 to 4 weeks after the final molt, a mating attempt could be made. Make sure that the female is completely satiated before you introduce the male to her enclosure. Mating can take several hours. The male must subsequently be removed from the enclosure, if he wants to live. The ootheca must be kept in the same way as the mantis itself. Beware of mold, it arises from an excessively damp environment and can be deadly to the mantis. From one ootheca around 20 – 35 nymphs will hatch.